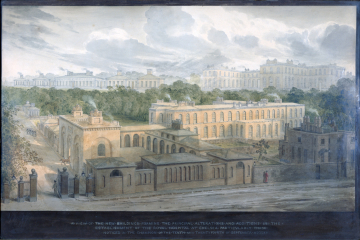 Soane office, London, Royal Hospital, Chelsea, composite perspective of the Royal Hospital in the form of a bird's-eye view of the Infirmary and additions, 1809-1815. For the preparatory sketch see Vol 60/123, dated February 1818. Exhib: RA 1818, no.908. The reference to The Champion in the title of this work is to the criticism of Soane's work published in that magazine anonymously by his younger son George in September 1815, the shock of which Soane believed had led directly to the death of his wife Eliza on 22 November that year. George's two articles attacked his father's work at Chelsea and elsewhere. 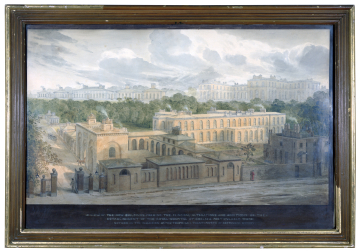 Soane was Surveyor to the Royal Hospital from 1807 until his death.